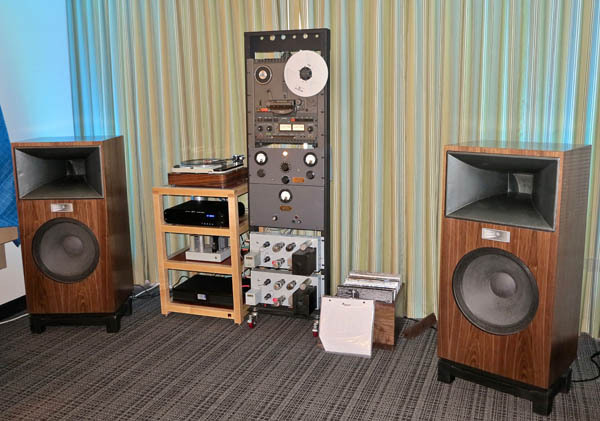 The apotheosis—some would say the nadir—of country music suffering was reached in the Western Electric Sound System room put together by Déjà Vu Audio South. There, Vu Hoang (above) took the perilous step beyond Steely Dan’s “Black Cow” (as in black sheep?) to Tennessee Ernie Ford’s “Please Release Me” and The Carpenter’s “This Masquerade.” The superb sound got me through a succession of despair-laden tracks from Western Electric Sound’s The Perfect Vocals CD that were titled—I kid you not—”These Days I Barely Get By” (Daryle Singletary), the aforementioned “This Masquerade,” “The Man That Got Away” (Rosemary Clooney), “The Party’s Over” (Nat King Cole), “Cry Me a River” (Jack McDuff), and the final track, “Only the Lonely” (Shirley Horn). Our collective savior came in the form of refurbished and NOS components that shook to the core my preconception that “vintage sound” amounts to a preponderant midrange without much of anything else. I heard: Déjà Vu Audio’s Custom Vintage speakers ($22,400/pair), which include an 18″ high efficiency woofer in a sealed cabinet, vintage WE 555 compression midrange driver, vintage 150hz bent horn with large air column, and Alnico-magnet horn supertweeter; Déjà Vu Audio by Aldo custom preamp with phono stage ($19,000); Déjà Vu Audio by Aldo DAC ($19,000); Déjà vu Audio Custom 124 Western Electric Monoblock amplifiers ($25,000/pair); restored vintage Thorens TD 124 idler-drive turntable with Ortofon cartridge ($5000); and J-Corder reel-to-reel deck (which I don’t believe I heard). From this system came absolutely beautiful sound that, honest to Betsy, extended beyond the midrange to a really lovely top end and solid bass. I wish I could have stayed for more, and that Art Dudley and Herb Reichert could have joined me. 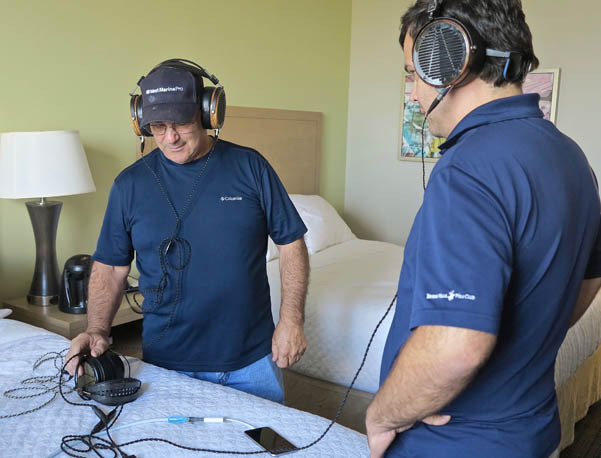 Bart Andeer, one of four owners of the Florida Audio Expo, paired his excellent Resolution Acoustics room treatment with a Play it Again Audio system that did not inspire requests for same. 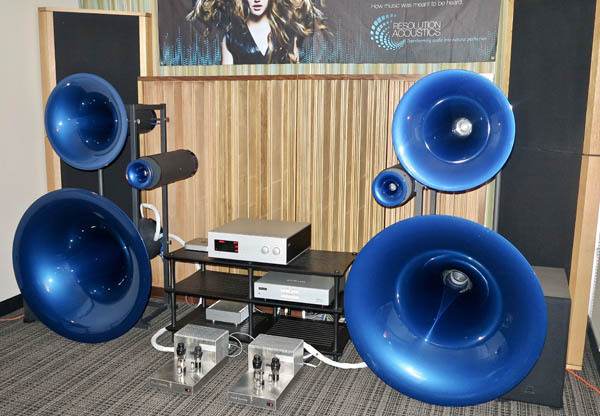 There was no equipment list, but the combination of handmade David Berning monoblocks, which were designed to mate with the room’s Avantgarde Acoustic Trio loudspeakers, a Soulution preamp, and bleeding-chunk snippets from seven pre-selected tracks made for a brief listening experience. I don’t know if designing their own loudspeakers and cabling is the reason that Raven Audio’s exhibit took a major sonic step forward from their previous audio-show displays, but that’s certainly my hunch. What I do know is that I heard an excellent sense of space on Luciano Pavarotti’s uncharacteristically expressive, beautifully sung recording of Puccini’s “Che gelida manina,” from the commercial recording of La Bohème conducted by von Karajan. Apart from a bit too much bass on Jennifer Warnes’ “A Little Bit of Lovin’,” the system sounded alive, colorful, and musical on every track I auditioned. 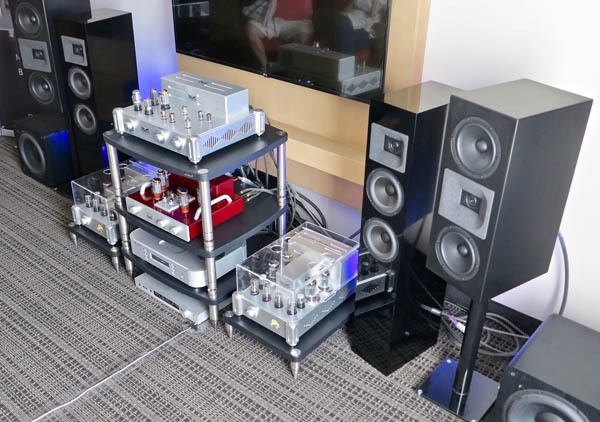 Heard: the pre-release premiere of the 92dB-efficient Raven Performance Tower speakers (the ones closest to the rack—$3995/pair), which mated perfectly with Raven’s 20Wpc Avian Blackhawk Mk3 tubed integrated amp ($3795), a Mytek Manhattan II DAC ($5995), and Soniquil interconnects. 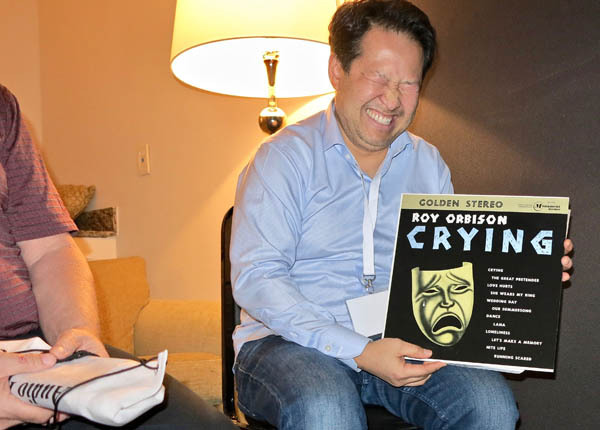 Although I missed cellist Vincent Bélanger’s live vs reproduced demos in the Audio Note UK room, sponsored by Déjà Vu Audio South, he virtually dragged me into the room after I encountered him in the hallway. He was especially excited by his fourth recording on Analog Music, produced by Audio Note’s Peter Qvortrup, which is due out in March and which I heard on a pre-release lacquer. When Vincent played, at exactly the right volume, his recording of “Kol Nidrei,” arranged for cello and organ, the beauty and spaciousness of the Aristide Cavaillé-Coll organ in the L’Église St. Pierre-de-Charentons was conveyed to perfection. 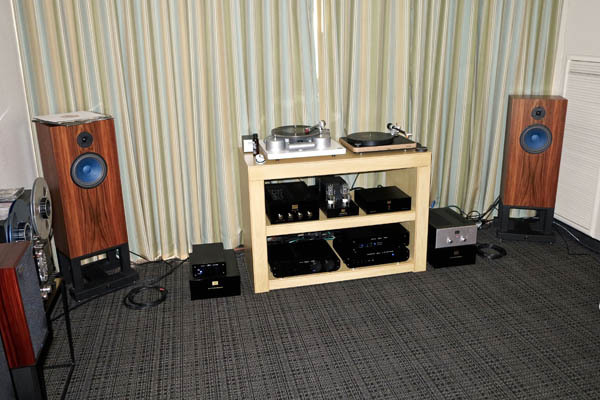 Doing the honors, in an all-Audio Note UK system (which needed more space than the room provided): Audio Note LX HE Signature speakers ($18,284/pair), Conqueror stereo tube amplifier ($5423), M2 preamplifier with phono stage ($4958), TT Three turntable with PSU3 power supply ($13,850), TT Two tonearm with AN-V cable ($1497), IO1 MC cartridge ($4132), S2 step-up transformer ($1291), and, un-auditioned, a DAC 0.1X ($1797). 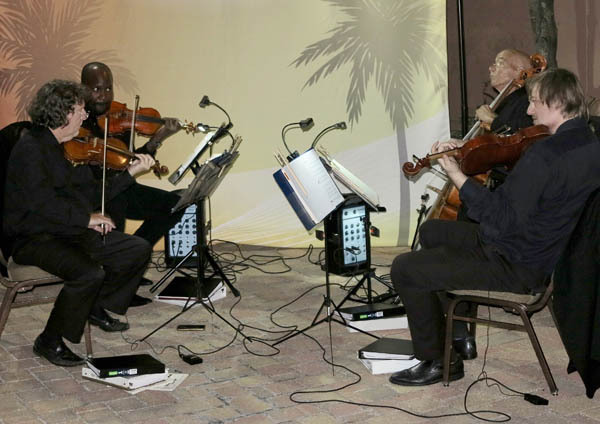 On the far side of the hotel pool, an amplified string quartet serenaded showgoers who were seated far, far away on the hotel’s second-floor balcony: I reached them only as they were about to pack up for the night. Yet given that I was the sole person standing before them, they offered to play another short piece in my honor. When I felt compelled to comment that the amplification was simply awful, they unplugged, and performed a beautiful, blessedly acoustic rendition of Piazzolla’s Oblivion. My sincere thanks to Bart Andeer, who made the performance possible, and to violinists David Dillingham and Lemay James, violist William Goodwin (former Principal Violist of the Ulster Orchestra), and cellist Gary Tussing.